Decorating your aquarium or pond? Look no further than aquatic plants. These can be used to provide a natural-looking aquarium “carpet” while simultaneously hiding the unsightlier parts of your aquarium or pond setup. Aquatic plants provide organic hiding places for the fish and make your aquarium or pond look more like a natural occurrence than a man-made aberration. 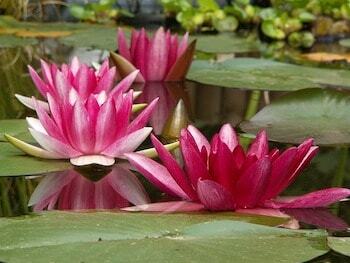 In today’s article we take a look at some of the best water plants for ponds or even aquariums. We’ve included floating aquarium plants, underwater plants, and even water flowers. Your decision concerning which plants to place in your aquarium or pond should factor in practical considerations. You’ll probably want to select hardy plants which require zero to low-maintenance. Green plants are generally favorable because they do not require as much sunlight in order to provide themselves energy through the process of photosynthesis. This means you won’t have to situate your aquarium or pond in an area of excess sunlight, which would stimulate the excessive growth of algae—which would have a negative effect on your aquarium or pond. This is a very hardy plant, perfect for aquariums as it requires minimal maintenance. The rosette is able to grow as long as 8”. The leaves are medium sized, oval-shaped, and a rich dark green color. It has variably long foliage and grows very easily from cuttings and as such, can be reproduced with minimal effort. 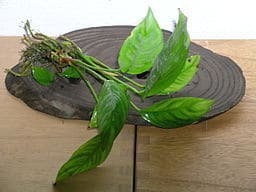 Anubias nana is often used in aquariums where it is attached to logs, creating an attractive visual backdrop. This plant requires moderate lighting. AKA the Brazilian Waterweed, this ideal underwater plant features brilliantly bright bunched green whorled leaves and branched stems. This plant anchors itself by its roots but also can float freely, growing completely under the water’s surface. This plant is perfect for ponds as a result of its leaves being attractive for fish and turtles. Also going by the name of African water fern, this is a somewhat slow-growing plant, but after the initial stages of growth, becomes a solid low-light/shade-thriving choice which looks fantastic thanks to its thick, yet feathery bright green leaves. This water plant is versatile and looks great both as a background or a foreground for your aquarium, but can also be used in ponds where its roots can cling to rocky/sandy beds. 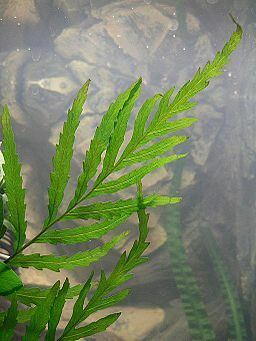 The African water fern performs superlatively in soft pH5-7 flowing water. Water lilies provide shade for your pond water, helping to curb algal growth. Its roots are anchored to the bottom of the pond or aquarium, keeping the plant’s growth within a restricted general area. In the summer, this pond-perfect plant comes into its own with dazzling blooms of various shades and colors: the most exotic varieties can show brilliant lush blue hues and stunning pinks. 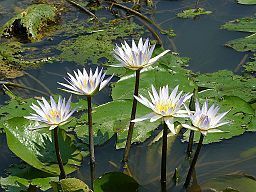 The stereotypical “lily” has a radial notch—a break in the overall circular shape. This is the case in the common Nymphaea and Nuphar varieties. The generally much larger Victoria nymphaeaceae have complete circle shapes. This plant has the unusual and poetic alias of “Beckett’s water trumpet.” It takes a few weeks to settle, but subsequently, this water plant is easy to manage. With its green (and slightly red) hues, this plant is really able to liven up your aquarium. It provides an unmatched hiding place for the aquatic organisms and can tolerate a variety of water types, pH’s, and light levels. This freshwater plant is highly adaptable to both full-on sunlight and partially shaded environmental ambiance. The most popular purple/violet taro variety has to be transported to a warmer place during the colder seasons. 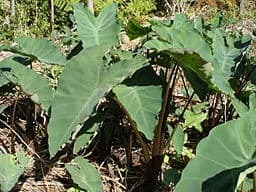 Their leaves, able to grow up to 3’, are arrow or heart shaped and look a bit like an elephant’s ears. The plant can grow up to 2’- 4’ high and ought to be kept in 1”-6” of water. The violet-stemmed taro provides an eye-catching highlight to the outsides of a pond. With its grass-like appearance, this freshwater plant is an incredibly fast grower (up to 2” tall), spreading out with remarkable speed across the entirety of your aquarium or pond’s lower surface. 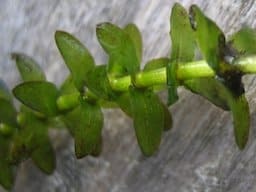 A minuscule floating plant, less than 8mm long, this plant has a leaf-like body with a single root submerged in the water. Able to reproduce rapidly from the buds of the parent plant, allowing multiple water plants to grow while connected. Because of its remarkable growth speed, this plant has to be controlled through the process of skimming off from the surface of the water. This might not be the ideal aquarium plant but it could be a great pond plant. Variably known as marsh cinquefoil, purple marsh locks; sprawled around lake edges, this attractive water plant cuts a striking image with its very dark purple stems and flowers, divided into 3-7 smaller jagged leaves. Primarily found in bogs and other slight acidic situations, this water plant has 3-lobed leaves, with spikes of pink/white and petals. Also known as bog bean, this water plant defies its unattractive name with its flashy bright colors. 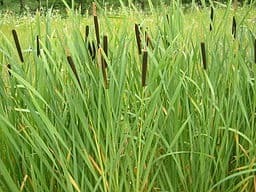 Cattail water plants frequently disperse their seeds and appear in ponds. These plants can easily take over smaller, shallower ponds through sheer density. They ought to be carefully managed in order not to take over the smaller ponds through their invasive natural inclination. 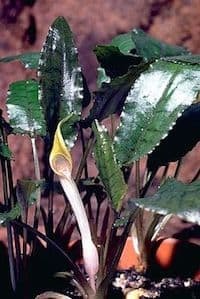 This is an attractive plant, but due to its incredibly rapid growth, should only be selected if careful maintenance is possible. 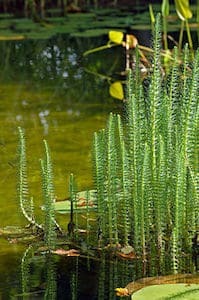 This water loving plant, AKA mare’s tail, predominantly thrives in shallower waters. A cornucopia of leaves around unbranched stems hides the flowers from sight. 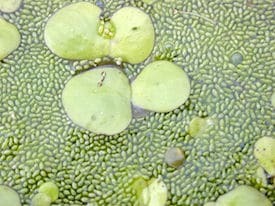 This plant spreads viciously in smaller ponds, but less so in larger lakes. Mare’s tail grows better in full sunlight but is productive in a variety of situations. These are also called water shields, and are rooted plants with floating leaves of an oval shape, normally around 10cm long. Deep purple and gelatinously coated, their stalks are connected to the middle of the leaf. Violet-colored flowers are positioned on top of the water. Whether you’re looking for the best water loving plants for a pond or an aquarium, it’s good to choose one you know will be easy to manage. Make sure you check beforehand how vigorously the plant can reproduce and invade a body of water. If you’re conscious about your impact on the environment then don’t miss our guide to composting toilets. We’ve also just posted an amazing guide on gardening gifts that we’re sure will give you some great ideas.